Heat a medium nonstick pan over medium heat and add 1-tablespoon butter or oil. Add tomatoes and a ¼ teaspoon of salt and sauté until the tomatoes just start to soften, about 5 minutes. Add asparagus and sauté for 2-3 more minutes, until tomatoes are browned and starting to burst and asparagus is bright green and tender. Set aside. In a medium bowl, whisk eggs together with ¼ teaspoon salt and ¼ teaspoon black pepper. 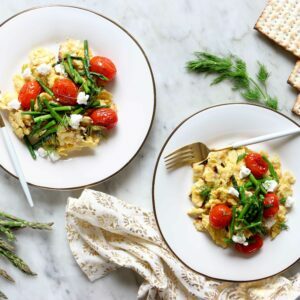 Soak matzah pieces in a small bowl of warm water or in a mesh colander under warm water for 10 seconds to soften slightly. Drain matzah and add to egg mixture and combine. Wipe off the nonstick pan and heat over medium heat and add other tablespoon of butter or oil. Add the egg mixture and sauté over medium heat while stirring until eggs are set, about 3 minutes. Divide matzah brei evenly on two places. Top with tomato and asparagus mixture, goat cheese and drill. Serve immediately.